Tall flames from the Ponderosa Fire can be seen on a ridgeline near Manton, California. This has been a devastating wildfire season. Nationwide, more acres have burned this summer than at this time in any other year on record. In May and June, New Mexico weathered the largest fire in its history. Hundreds of homes and tens of thousands of acres have burned in Colorado. As the summer wears on, fire season has moved west — as it tends to do — and now the Ponderosa Fire is raging near Redding. Has it always been like this? A new NPR series by Christopher Joyce explores what a century of fire suppression has meant for forests in the Southwest. In addition to the video above and five radio pieces (the first two aired today), there’s a fire map that shows current large fires and fire conditions, and a series of photos showing the evolution of a forest where fire is suppressed. 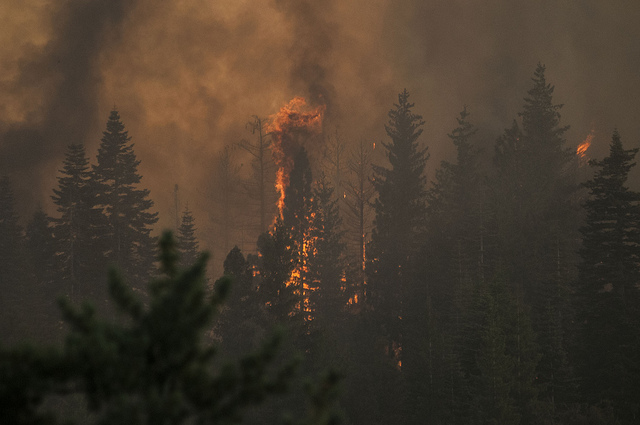 Fire suppression is only a piece — though it’s a big one — of the wildfire puzzle. Beetles, disease, drought and logging are all in the mix, too. And then there’s climate change, which scientists project will bring more fires to the West — not just in the long-term, but within the next few decades.